If you’ve been in the wilderness lately, you may wonder if the itching and blisters you’re experience are the signs of a poison ivy rash. Not everyone who is exposed to the plant will break out. But, the majority of people who come in contact with the plant will break out. Poison ivy starts out as small fluid filled blisters or pustules. They may be accompanied by intense itching, particularly after they appear and begin to break open. Some blisters will dry up without blistering. The important thing to keep in mind is to avoid scratching the area with the poison ivy rash and the surrounding area, at all costs, as this can help the rash spread. If you have been outdoors and believe you may have come in contact with the poison ivy, oak, or sumac leaves, wash the affected areas right away and wash any clothing that may have come into contact with the plants. Skin and clothing will carry oils from the plant, which cause the rash. Washing with mild soap and water may remove much of the oils from the skin. If you’re lucky, you may be able to avoid getting a rash. However, if you still break out, it is important for others to avoid the affected area. Usually, the small blisters will appear as slightly red, raised blisters, about the size of sunflower seeds or smaller. They can become larger, particularly if scratching occurs. You should particularly suspect poison ivy rash if it spreads from the initial area of contact. The rash will only spread to other parts of the body if the initial rash comes into contact with them. If you are unsure about the rash you have, a dermatologist can make a final diagnosis. Most people, however, are aware they may have come into contact with the leaves. This is particularly true of those who spend quite a bit of time outdoors or in the woods. 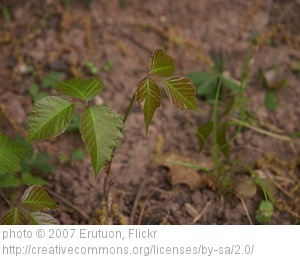 Poison ivy rash is probably not going to be a surprise to those who spend plenty of time in the woods or open fields. The current recommendations are to avoid applying any type of cream or topical antihistamine to the poison ivy rash. They are generally not effective in controlling the rash or itching. Cool compresses can be effective in reducing the inflammation of the blisters and can ease the intensity of itching. Some over the counter remedies made specifically for poison ivy rashes can help dry up the blisters and take away some of the itching. Applying alcohol to the affected are should be done with caution, as the liquid can help the rash spread. Applying alcohol or baking soda to individual blisters is the best way to avoid spreading the poison ivy rash. Dermatologists also recommend special preparations designed to ease the discomfort of a variety of rashes. Oatmeal baths or baking soda baths can help soothe the skin and take away the itching. When getting out of the bath, make sure to pat the area dry, rather than rubbing it. This way, you will avoid spreading the rash, particularly if some of the blisters have ruptured. Another point to consider, when treating a poison ivy rash, is that small children may be unable to avoid scratching. Sometimes covering the area with breathable gauze can help. But, keeping the area dry and open to the air will help it dry quickly. Most cases of poison ivy rash clear up in 2 to 3 weeks, as long as they don’t become infected through scratching. If you will be around others at work and have a visible rash on the arms or legs, you will want to keep these areas covered, to prevent the possible spread to those you work closely with. Leaving the rash visible, in plain sight, may cause panic among co-workers. Covering the rash, if at all possible, is the best way to avoid causing undue stress to others and to yourself. A poison ivy rash will eventually go away on its own. There are no magic pills or creams that will make it vanish overnight. The best treatment is to keep the area as clean and dry as possible, while making sure to avoid contact with others, from the affected area. You will not likely require medical attention, unless the rash covers large areas of the body and you are extremely uncomfortable from the itching. Most people are able to get on with their lives and recover from poison ivy rash, by adhering to these simple self care tips. I like summertime. Even though I haven’t been a student for several decades, I still think of summer as break time, a chance to kick back, enjoy the sunshine and relax a little. If it wasn’t for that pesky part-time job and full-time motherhood thing, I could really do some serious lounging. Spending time outdoors in the warm weather is a great way to unwind, but a person has to beware of dangerous flora and fauna lurking around. Actually, aside from a few disgruntled groundhogs, the fauna in our yard isn’t all that deadly, but the flora is potentially fraught with peril. I don’t mean large, carnivorous shrubbery that devours people, (although I saw that once in a science fiction movie, and I believe it could totally happen), but the more insidious, itchy kind of danger you get from plants like poison ivy. Poison ivy, whose scientific name is Toxico radicans, has been around for a long time. It was first discovered and named in America by Captain John Smith, the famous 17th century explorer and friend of Pocahontas. Poison ivy and its equally treacherous cousins, poison oak and poison sumac, are found throughout most of the United States and cause an itchy rash following contact. Most people are susceptible to poison ivy, although about 15 percent of the population is not sensitive to the effects of the plant and does not get a rash. The rash of poison ivy is caused by the plant oil urushiol, found in all parts of the plant including leaves, stem, and roots. Your child may develop symptoms through direct contact with the oils on the plant itself, or by touching a contaminated object such as clothes or shoes. The plant oils can remain on objects and retain potency for many years. Pets can carry the plant oils on their fur, although they do not get the rash. Burning poison ivy releases the oils into the air, and the particles may travel airborne to the skin or be inhaled. Touching another person with poison ivy does not typically transmit the rash, since the plant oils are quickly absorbed into human skin on initial contact. The poison ivy rash is red and itchy, often with blisters in a straight line. The reaction may not appear for several hours to days after exposure to the plant oil. The rash is not contagious, but can be spread from place to place on a child by residual plant oil under his fingernails when he scratches. If your child has been exposed to poison ivy, wash the area with warm soapy water as soon as possible to remove the plant oils before they are absorbed into the skin. Water that is too hot may open the pores, allowing for increased absorption. Apply a cool compress or an ice cube to relieve itching and swelling. Oatmeal-based bath products and lotions (like Aveeno) and oral antihistamines (Benadryl) can be helpful for symptoms as well. Calamine lotion, a combination of zinc oxide and iron oxide, has been used to treat the itch of poison ivy since the 19th century, but it can be quite drying for some children with sensitive skin. Over-the-counter 1 percent hydrocortisone cream can be used in mild cases, and your doctor can order a stronger prescription steroid cream or ointment if necessary. While most cases of poison ivy go away on their own within two weeks, you should call your doctor if your child’s rash is particularly extensive, extreme or appears infected. Significant lesions on the face, especially around the eyes, may warrant a visit as well. Your doctor may prescribe oral steroids (or occasionally, a steroid injection) to relieve inflammation. Topical or oral antibiotics are indicated for a rash that has become infected, usually through repeated scratching. An individual’s sensitivity to poison ivy can change from season to season, so even a highly susceptible person may become less responsive to the plant oils over time. In the interim, it might be best to stay away from foliage with leaves of three and avoid any shrubbery with a shady attitude.